I saw a card on Splitcoaststampers that I thought was beautiful, so I CASE'd it (thank you Vicki Burdick!). I think this layout is just perfect. I changed up the colors from Vicki's and used a different background, sentiment and added an extra layer of framing. I love the combination of the soft blue (Baja Breeze) and the bright green (Kiwi Kiss). Hope you like. I started by sponging the small piece of Whisper White cardstock; the bottom 1/3 with Kiwi Kiss and the top 2/3 with Baja Breeze. 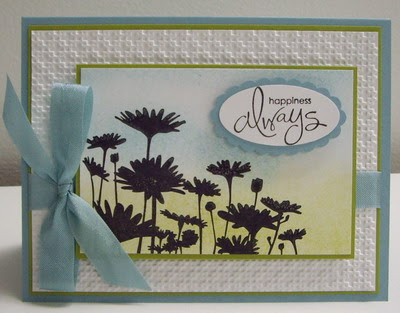 I stamped the Daisies in Craft Basic Black to the left of the page. I let the ink dry before mounting the main image onto a frame of Kiwi Kiss (I just wanted a very small border of green, so the frame is only 1/16" all the way around). I ran the large piece of Whisper White cardstock through my Big Shot with the Square Lattice embossing folder. I then cropped the cardstock to 5 1/8" x 3 7/8" and mounted it on the corresponding frame of Kiwi Kiss (again, just 1/16" border of green for a small pop of color). I layered the Baja Breeze seam binding over the embossed cardstock and tied a bow on the left side. I then mounted this onto the card base. I mounted the stamped image on top of the ribbon, popping it up with dimensionals to give it depth. I also popped up the sentiment with dimensionals. I layered the remaining piece of Whisper White cardstock on the frame of Kiwi Kiss and mounted it to the inside of the card. Labels: all occasion, CAS, CAS mixed media, dry embossing, Stampin' Up!